An award-winning Rotherham-based online supermarket is celebrating its first birthday having delivered over 1,000 orders to happy customers across the UK. Food Circle is the first online UK-based retailer offering surplus "in-date" healthy food and drink products, to customers at half the recommended retail price. It was launched by Sheffield Hallam history graduate James Barthorpe and his business partner Paul Simpson in January 2018 with support from the Rotherham Investment & Development Office (RiDO) and other local support organisations. 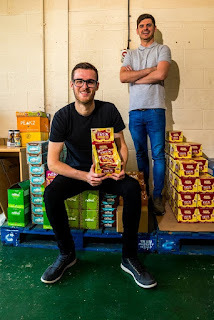 The co-founders attribute their success to a number of factors, but not least the fact that customers can buy products at half the recommended retail price, whilst diverting food from landfill - cutting down on the UK's huge food waste problem. James Barthorpe, co-founder of Food Circle, said: "The past year has been a busy one for us, we've moved into new premises twice due to expansion, got a new delivery partner, expanded our product range and have built up a very loyal customer base." The loyalty that James speaks of is in no way down to luck, but stems from the company's personal approach to their customers, quick turnaround times and branded products. Paul Simpson, co-founder of Food Circle, said: "We've invested heavily in social media on Facebook and other platforms and this has really paid dividends, especially in the fitness and sports nutrition markets where we’ve seen a boom in sales from gym goers and other sports people." The company has recently moved to RiDO's Matrix@Dinnington Business Centre, allowing for continued growth of the business, which aims to more than double orders over the course of 2019. Andrew Klinkenberg, key account manager at RiDO, said: "James and Paul have achieved a huge amount in their first year, and should be proud of their achievements. This is in no small part down to their skills and experience, but also their willingness to engage support throughout the Sheffield city region to constantly evolve the business." The enterprise has been backed by UK Steel Enterprise, taken part in the Y-Accelerator programme and won the Hallam Enterprise Award.